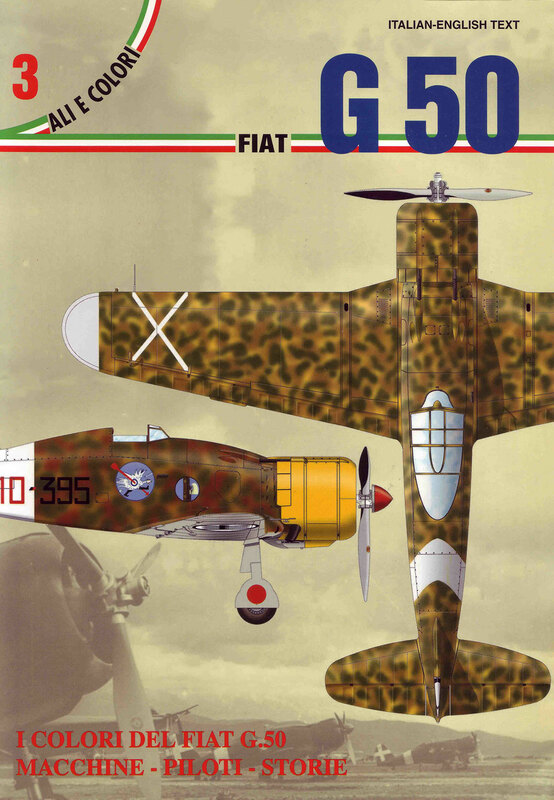 Fiat G.50 bis of 165a Squadriglia, 12° Gruppo Autonomo d’Assalto, Castelbenito, July 1942. This aircraft wears a so-called 'green lizard’ camouflage scheme of Light Hazelnut Brown blotches on Dark Olive Green background, with Light Blue-Grey undersurfaces. Wing national insignia carried on clear roundels. This aircraft is a late production Fiat machine, mounting wing bomb racks, tropical filter and late-type long spinner. Paintwork is showing sure sign of retoucing, specially in the tail area and near the small size codes typical of this group. Since the end of 1940, when 50° Stormo d’Assalto has been disbanded, 12° Gruppo continued operating autonomously in North Africa. It was in the Spring of 1942 when it received new G.50s to replace the old CR.32s it previously operated. With its new equipment it was involved in the Axis offensive destined to reach the maximum penetration into Egypt, reaching El Alamein in the summer of 1942. The group was later returned home in August 1942.